Almost any trip from the San Francisco Bay Area to Yosemite National Park will take you along scenic Highway 120 through the gold rush era town of Groveland and on into the park itself. Almost every business in town is locally and family owned and operated, and caters to both local residents and tourists alike. 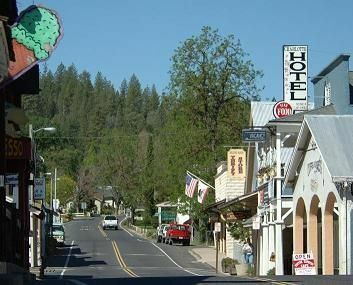 Groveland is only 24 miles from the Big Oak Flat entrance to Yosemite, and offers the traveler many choices in lodging, dining, and recreation. Pick from quaint B&B style hotels to upscale Vacation Rental houses. Choose between Mediterranean cuisine at CafÃ© Charlotte with its wide menu variety and homemade specialities, traditional English Tea in the afternoon at Dori’s Tea Cottage, Pizza or Burgers at various local establishments, Mexican at La Cochina, and breakfast at local family diners. Looking for something to do in the afternoon after checking into your lodging? The Groveland Museum is wonderful, with exhibits and a video about the area. Stroll the town with a historic walking tour pamphlet from the Yosemite Chamber of Commerce, whose office is easy to find and offers travel information or stop in at Hotel Charlotte where you can find Yosemite guides, hiking maps, and on-staff Yosemite experts. Groveland is home to the community of Pine Mountain Lake which offers a public Golf Course and Country Club, Equestrian center for horseback riding, and small plane airport. The local Community Park has a world class skateboard park, basketball courts, picnic tables with BBQs, horseshoe pits, public toilets, playground equipment, and grassy areas for the kids to run. And for the adults, the infamous Iron Door Saloon is right in the center of town, across the street from Hotel & CafÃ© Charlotte. Nearby activities range from White Water Rafting on the Tuolumne River to bird watching, and from Wine Tasting to swimming under a Waterfall. Family Friendly? Yes, absolutely, we are Where Folks Have Fun. Need Yosemite Travel Advice? No worries, let us help you!